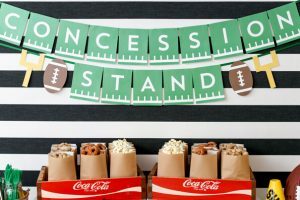 Hosting a Superbowl Party? Here are five simple decor ideas that will make your guests cheer, TOUCHDOWN!!! All drinks and appetizers will be served on the field! Turn your kitchen island or dining room table into a football field. 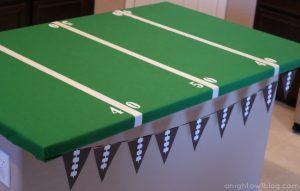 Wrap your serving table with green felt, white duct tape for the yardlines and pre-cut numbers. Your guests will get a kick out of it! Grab your mason jars, white primer, acrylic paints and paint brushes because it’s time to get crafty. 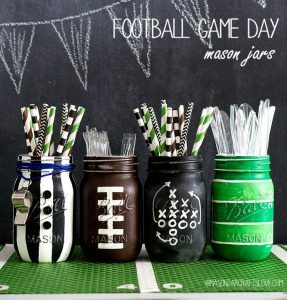 Paint the mason jars to look like a referee, football and chalkboard game play. These jars are great to hold utensils, straws and make great centerpieces to add to your football field table. Whats the Superbowl, without the football? Just a bunch of men tackling each other. Turn your ice chest into one big football, something Tom Brady can’t deflate. All you need is a large metal bucket, brown fabric (preferably suede or faux leather) and white duct tape. Wrap that baby up, fill it with ice and store drinks in it. You can also add a touch of color to all the green and brown decor by filling the football bucket with flowers, plenty of them! Everyone loves a good ol’ penalty flag, especially if it’s for the opposing team. 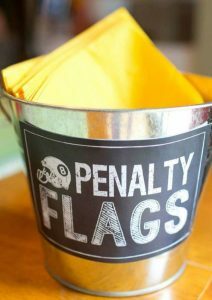 Label a metal bucket or mason jar with Penalty Flags and fill it with yellow napkins. And the crowd goes wild for FREE PRINTABLE BANNERS, LABELS AND MORE! It’s easy to find, it’s free and cuts down on craft time so you have more time for the important things, like food! 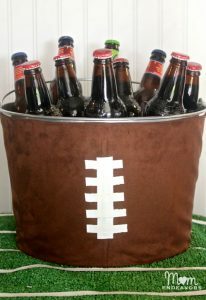 Google Free Printables for Superbowl Party and you’ll find banners, signs and even labels for your bottled drinks. FOLLOW ALL FIVE OF THESE SUPERB IDEAS AND YOU’LL HAVE YOUR LIVING ROOM LOOKING LIKE A CONCESSION STAND. ALWAYS REMEMBER, PLAY LIKE A CHAMPION TODAY!